located on a MAC '/applications/joomla-3.4.3-1/apps/joomla' this will display all files in the left side panel of the IDE. 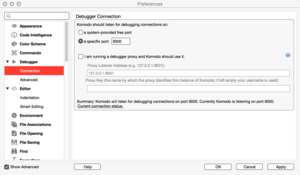 This will allow you to directly edit and debug your code. 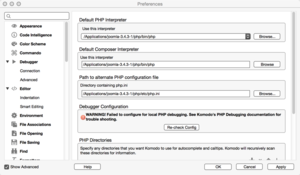 Under 'Komodo should listen for debugging connections on:' Change option to 'a specific port:9000' make sure it is set to 9000 this is what should be set in the php.ini file. 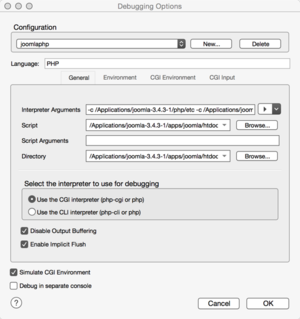 Under the label 'Select the interpreter to use for debugging select option' - 'Use the CGI interpreter (php-cgi or php)'. When ok is click it will start to run and open up the index.php and stop at the first entry point. From there you can go/continue, step in, step over, and step out. If go/continue is selected it will goto the first breakpoint in your code if you have created one. This page was last modified on 26 July 2015, at 12:37.